← Reconcilliation Project, Uncover Our Hearts at Wounded Knee…the truth about the Seige of Wounded Knee! Why doesn’t anyone do their homework & research, specifically non-native people….before supporting the biggest hoax-fraud in history? Celebrity, fame, hype, propaganda & myth making???? The BIGGER THE LIE…the more people will believe it! These people involved with this group should speak to a few of the victims & survivors of the American Indian Movement & Arvol Looking Horse, before buying into this fraud hook, line & sinker! 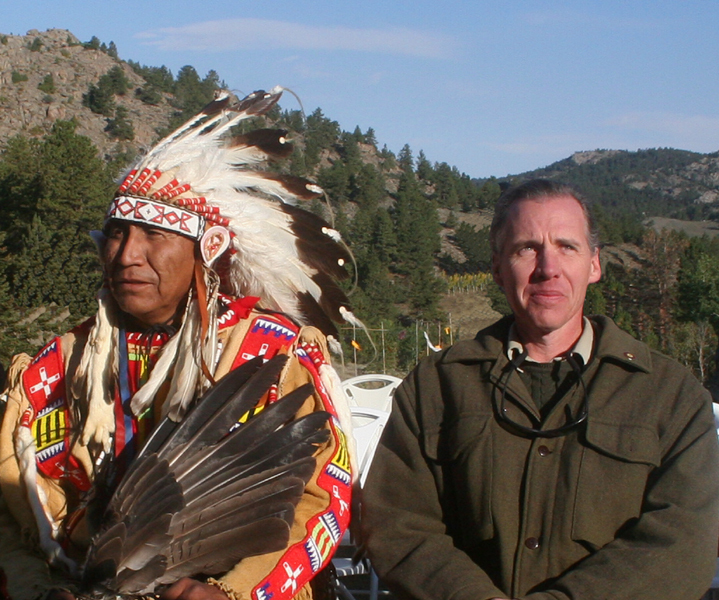 When I first began to attend Shambhala meetings, I wondered if making a commitment to be a Shambhala member would mean I would have to forsake cultural activities linked to my Native American heritage. Starting in my late teens, I attended ceremonies, sweat lodges, and in high school I wrote for the Native American student newspaper, “The Eagle Speaks.” The wisdom I gained from elders and the sense of community has been an essential part of my life. When I learned about Cankatola Ti Ospaye (chan-kha-toh-la tee oshe-pah-yeah), a group of Shambhalians who have established an ongoing relationship with the Laktoa tribe, I contacted the group’s president, Jim Tolstrup, a Shambhala member who has been involved with the Native American community since he was a teenager. Jim grew up in the suburbs of Boston, thousands of miles away from the Pine Ridge reservation, a place that would come to be like a second home. Jim’s is a fascinating story that I wanted to introduce to the Shambhala community. When I graduated from high school, I headed straight for the Rosebud Sioux Indian Reservation in South Dakota. There I met medicine man Norbert Running who had invited me to come to his house and stay with him and his family. Almost every night, Norbert would hold healing ceremonies in which people would gather in a large empty room in his house. During these first ceremonies I attended, I was doubtful and confused. After I had lived there a while, Norbert took me out to a remote hill to Hanbleceya to fast and pray. What I mostly remember about this was that I heard country and western songs in my head over and over, “Ya picked a fine time to leave me Lucille.” It was the kind of music Norbert’s daughters listened to on the radio. Ten years later, I met my spiritual friend Sam Moves Camp. Sam is a traditional Oglala Sioux medicine man. He is a direct descendant of Woptura (wope-too-kah), a great holy man of the last century and Crazy Horse’s mentor. After I participated in sun dance and many years of fasting, Sam made me a pipe-carrier. 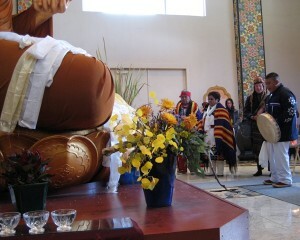 This meant that I had the responsibility of pouring water for sweat lodge ceremonies and helping people who were sick. In 1987, around the same time that I met Sam, I met Pema Chodron at an introductory program to Shambhala meditation. I sensed an immediate connection between Shambhala teachings and what I had already experienced among Indian people. At the end of the program, I had a brief opportunity to question Pema about this connection; she handed me a card with her address. Pema wrote back after I had written to her. In her letter, she related a story that I was to hear numerous times over the next 16 years, the story of the now legendary meeting between Chogyam Trungpa Rinpoche and Gerald Red Elk, an elder of the Lakota tribe. How did Cankatola Ti Ospaye come together? At the end of the four days of the sun dance in which I participated, I stood there in the center, on wobbly legs, with the non-native people lined up to my right, including 12 members of the Shambhala Mountain Center community. Sam tied the tail of a woodpecker onto my head. This, he said, was in his first vision that he had when he was a boy. The woodpecker represents unity. Sam said that tying the feather on meant that I was now the chief of the non-native practitioners and a bridge between native and non-native cultures. What is Cankatola Ti Ospaye’s role in the Native American and Shambhala community? Cankatola Ti Ospaye is a non-profit organization that supports native elders in the teaching and continuing of their sacred way of life. What are some of the activities Cankatola Ti Ospaye has been involved with? There are numerous examples of interaction between Shambhala and Native spiritual leaders. In 1976, during a visit to the Four Corners area, the Sixteenth Karmapa performed a ritual to bring rain to the parched crops of the Hopi Indians. Trungpa Rinpoche had close friendships with Little Joe Gomez, an elder from the Taos Pueblo and other native people. 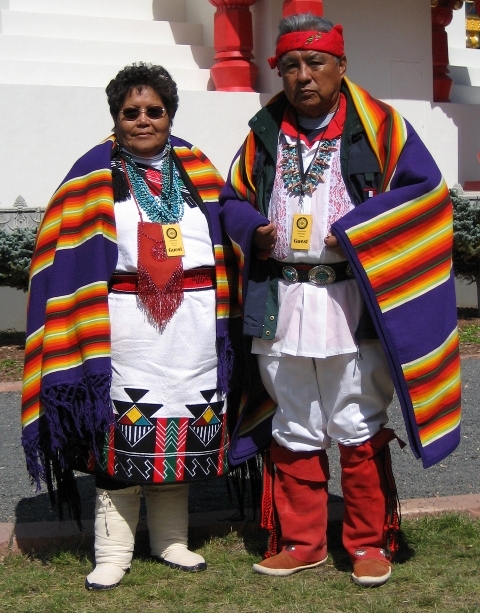 In 2007, we were able (through donations) to purchase a home for Sam Moves Camp on the Pine Ridge Reservation. The next year we helped Chief Arvol Looking Horse to repair his vehicle so that he could continue his important work in promoting world peace. Chief Looking Horse is the former recipient of the Temple of Understanding Award from the United Nations. In 2006, Cankatola Ti Ospaye brought him along with a small group of Native elders to meet with His Holiness the Dalai Lama at Shambhala Mountain Center. It was a high point in my life to stand next to Chief Looking Horse. As His Holiness gently squeezed my hand, they chatted about where they had met before. There have been hundreds of sweat lodge ceremonies at Shambhala Mountain Center over the last 10 years (more than 1,000 people have participated). Many people living at SMC have found the sweat lodge to be a very helpful and safe place to process illnesses, deaths, and social issues, as well as a place to celebrate and give thanks for healing, births, and marriages. Currently, I am working with Acharya Adam Lobel on a program outline that would allow Shambhalians to access indigenous wisdom authentically, without cultural exploitation. It is often a controversial issue of whites participating in Native American ceremonies. Can you talk about that? There had been a lot of controversy that year about white people participating in sun dance and the legalities of non-natives using eagle feathers, which are restricted by federal laws. Sam said that we should use the woodpecker and through this he said, “Your voice will be heard throughout the universe.” It was after the sun dance ceremony that the Shambhala members were adopted into the ti ospaye. Then an honoring song was sung for us and everyone came out and shook our hands. 5 Responses to More believers of the lies & propaganda of Arvol Looking Horse & the American Indian Movement! All anyone has to do is do abit of research to learn the truth about the Arvol Looking Horse fraud…. This is the Marie Elk Head Fiddler UTube video which dispels any misconceptions about Arvol Looking Horse having the Sacred Calf Pipe-Pte Hincala Cannunpa Kin, & AIM’s role in the fraud, after finding out the Looking Horse family NEVER had the Calf Pipe in the first place!!!! Yep, Kool-aide drinkers…this is you too!